I've met a curious bug in 3.4.0 today, which is not happening in 3.4.1. I've never heard about such problem before; either it is too rare, or nobody reported. The situation was that there is a room with a wall, which is also walkbehind, and there is a painting on that wall, which is an object with baseline = walkbehind's baseline + 1. This painting is visible all time, because its baseline is higher than the one of the wall's, but when certain other unrelated object gets its visibility changed the painting suddenly drops through the walkbehind and appears behind it (although baseline is supposed to stay the same, it is never changed in scripts). Setting baseline to (walkbehind's baseline + 5) fixed this, but why was it happening at first place? I was breaking my head, until I checked same game with 3.4.1 and the bug was not recurring there. Then I remembered that for 3.4.1 I changed the code that was sorting room elements by their Z order, from C-style sorting (using qsort) to C++ STL sorting (using std::sort). Can that be that some ancient bug was fixed along this change? - Removed limit on the script names of Inventory Items, GUI and GUI Controls, as well as GUI event function names. BTW, something I forgot to mention prior, Dialog script names are also not limited to like 20 letters since previous Beta. - Support Right Alt for Alt+Enter (switch fullscreen/windowed) and Alt+Ctrl (lock/unlock mouse in window) combinations. - Fixed screen not getting repainted in software (DirectDraw 5) mode when switching from fullscreen to windowed (or vice versa). But I noticed another problem... To be able to test the previous issue, I had to fix errors in my script (e.g : change "default" to "" for Game.TranslationFilename). If using editor + acwin 3.4.1.4 : I only get a generic error message, without the error line number (the error says about this : object reference not defined by an object instance). If using editor 3.4.0.16 + acwin 3.4.1.4 : I get a more detailed error message, with the error line number (the error says : null pointer referenced). Do you mean compilation errors or runtime errors you get during debugging? Can you give an example of script line that you were dealing with? I'm embarassed because I can't find the source of the error message I get in the beta version. 2) I tried 3.4.1.4 editor : compiling and running both failed, with getting a "generic" error message, without any more informations. 3) I tried 3.4.0.16 editor alongside acwin 3.4.1.4 : compiling and running work ; I got a "documented" error only when the faulty line was reached (null pointer referenced, with line number). The error pointed to line 3 : gStart_Screen.Visible = true; of course, since Game.TranslationFilename == "default" was impossible. Error fixed. The error is at line 17. To know more about the error with the beta version, I must fix this new error but I do not find its cause (since acMusic_start was defined at the top of the script and did not cause any problem prior in the script - but there are many chances the error is my fault). One thing I can tell at this point, you cannot use 3.4.1 acwin.exe with 3.4.0 Editor, because 3.4.1 engine cannot find audio files in debug mode without additional parameters passed from 3.4.1 Editor. This was probably the reason you were getting null pointer errors with acMusic_start, since no music played and channel pointer remained unassigned. What is this "generic error message"? There is too little information. Can you just copy whole error message, or post screenshot whatever is easier for you? Yes, I know... that's the problem : I don't know where to start ! By double clicking on the error in the message list, it doesn't do anything. - this behaviour does not happens. edit : I'll try to investigate further by disabling this audiochanel reference when I'll have time... It's very possible there's a flaw in my script. edit 2 : I deleted all reference to audiochanel. It's the same. This is not script error, this is program error, which occurs during creation of game files. Therefore there is no line number. 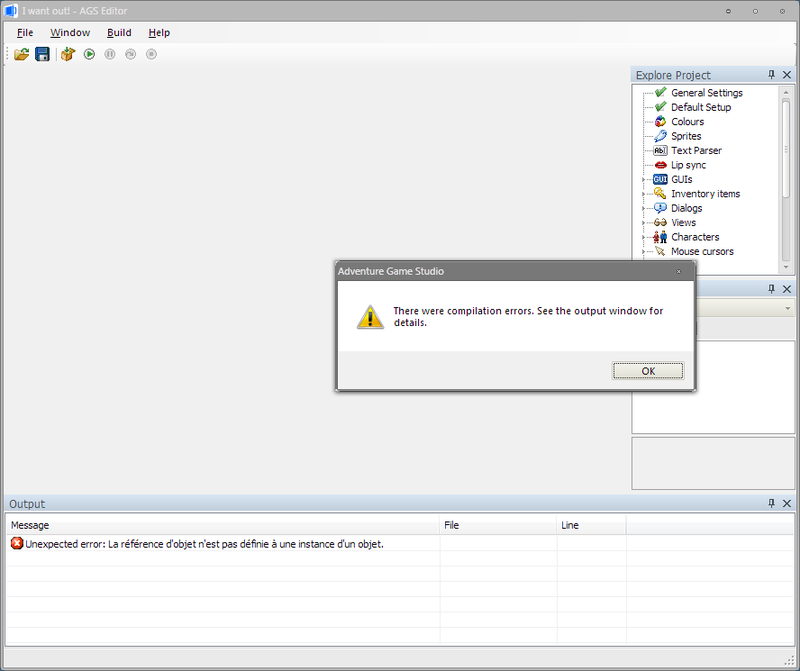 This kinds of errors are not very informative in AGS Editor. Is it possible for you to send me the failing game project? That would be fastest way to find out what's wrong. Alternatively, I will change the way such error messages are printed to see more details. Yes, it works, now ! On my way, I just saw another thing (why would I stop to bug you... ? ) : alt-enter sometimes restart the game (like F9 does) instead of switching between fullscreen / windowed modes. LeftAlt + Enter gives same key code as F9. I thought I made it not go into scripts, but probably it still does. Problem is that I cannot reproduce this anymore. Anyone have this error too? Is it possibleI fix it ? This error happens when compiling the speech file. I usually test with games without speech, so I could miss it. 1) Option 1. If you send me your FULL project, then I will be able to catch the error under debugger. This is ideal for me, but if I remember right you do not like to upload big data because your internet connection is not good enough? 2) Option 2. I can make editor to write a log of its progress during speech.vox compilation, and see at which point it breaks. Maybe that will give some hint. Wait! It is not solved! There is clearly and error inside the Editor, and I need to find out what it is. What if it happens again to someone else?! Can you send me that wav file just in case? How was it named at least? The generated acsetup.cfg in Compiled>Windows contains wrong/old content, for example the driver is set to DX5. So the editor creates the 'old' acsetup.cfg, but the winsetup creates the correct cfg.